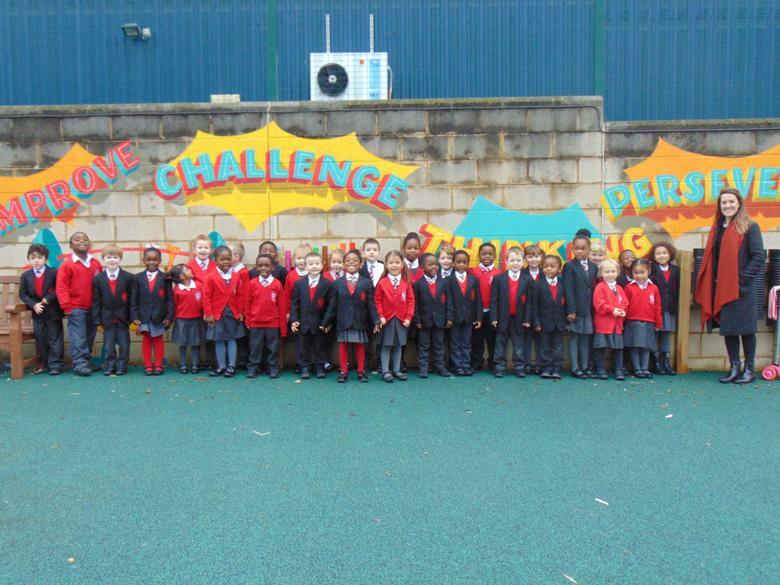 St. Joseph’s Catholic Infant School has been reflecting on their Growth Mindset to improve resilience and learning. To support the children a mural was commissioned and the children watched our Artist Mia develop this over a week. Our Mural focuses on our Growth words which we explore and use at school. Please try to remember to use them at home. Effort is…the secret to getting smarter. The more targeted effort you put in, the more you’ll get out. You can help your children to focus their effort and attention and encourage them to practise. Regularly recognise this effort with effort praise. Difficult is…challenging – an exciting opportunity for risk-taking and having a go. Create excitement with your child as they take on a new challenges and push outside their comfort zone. Recognise each achievement and point out to them how much they’re learning. Mistakes are… learning opportunities. Help your children to see that mistakes are feedback (not failure). Recognise that when working outside their comfort zone, they are likely to make mistakes that they can learn from. A small and empowering word, “YET” shifts thinking from a fixed to a growth state instantly. Use it in conversation with your child.